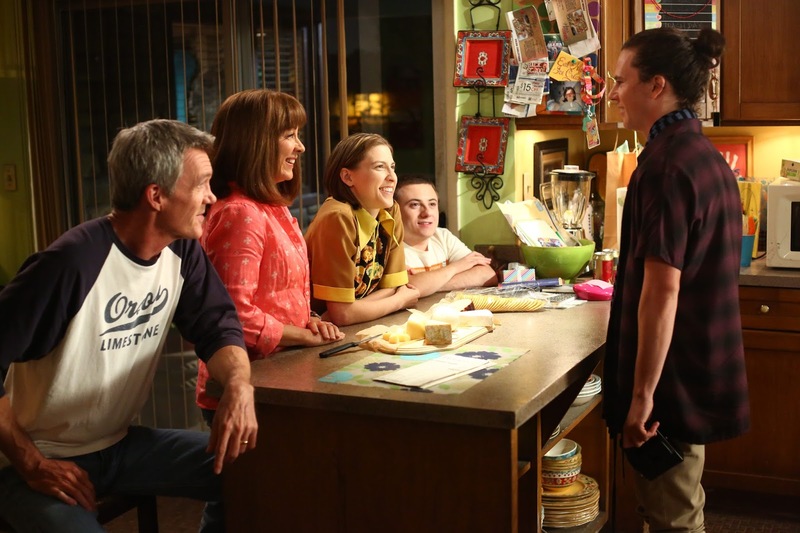 After eight seasons, the Hecks are returning to our television screens for one more year. The bittersweet farewell begins with tonight's ninth season premiere. The episode begins with the Hecks preparing to welcome Axl home, which includes a lot of hilarious lines, such as when Mike tells Brick "Go somewhere and we'll miss you." It's also funny and very typical when, right after getting home, Axl goes to see Lexi. Finally, Axl tells his family about his time in Europe at night, and it's very funny when Brick asks about the manuals and when Axl's gift to Sue isn't as good as his gifts to everyone else. Mike wants Axl to get a job now, but Frankie doesn't want him to push him. This story doesn't actually end up going much of anywhere though because the episode has other things to focus on. Brick decides to break up with Cindy, so he goes to his family members and asks them how he should do it. Their advice is of course bad, and the funniest moment out of all of it to me was when Mike says that he might have a couple of girls who still think that they are dating. Brick's breakup ends up being hilariously blunt, and I also thought it was very funny when Cindy kicked Frankie. Also, Sue tries to fit all of summer into two days, which is a very typical Sue sort of thing to do, and is also very funny. Frankie spends the episode trying to decide what they should put in the Orson time capsule. When she talks about how the Hecks will be remembered, it really points out how this story fits into where The Middle is at in its life, looking at the end and how the show will be remembered beyond that. At the end of the episode, she tells her family she is worried about being overlooked, which is very fitting for The Middle, which has been overlooked throughout its eight seasons so far. This episode had a lot of funny moments, and the Frankie story was very fitting for the final season premiere. The only weak point of the episode was Mike pushing Axl to get a job, because it didn't really go anywhere. What did you think of "Vive La Hecks"? Leave your thoughts in the comments!